Is your inventory outgrowing your warehouse? Before you start expansion plans, contact the material handling experts at Easy Street. Simply switching to our multi-directional or very narrow aisle lifts can cut your space needs by as much as half! 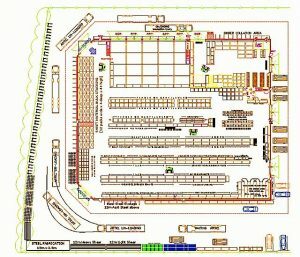 Our complimentary warehouse planning service can show you how. Our experts will analyze your specific needs. We’ll develop a plan that will work, because it’s based on decades of experience. By blending our unique material handling equipment with space-saving technology, we’ll show you ways to optimize your space, manpower and uptime. Contact Easy Street Material Handling Equipment today for information, pricing and support. Maximize Your Warehouse Space Today! Our experienced team will perform a free, no obligation analysis of your space. Together we can find the best way to maximize productivity and safety while minimizing your cost and down time. Are you losing inventory to product damage? Is that damage happening in the picking process? Aligning lift truck forks with the target is tough to do right. Drivers often damage packaging and even product because they can’t see the target well enough. Even experienced drivers make mistakes when the racks are more than 10 feet high. Lift truck operators can stop guessing with our EZ Laser Guide. The unit mounts to a fork carriage. Depending on the model, the guide will project a red laser dot or line where the forks will meet the product. Operators can work faster, more safely and without damaging product or packaging because they know exactly where to aim the forks before they advance them.